On Day 2, President Lee and Vice President Kim visited Koshien again to meet President Takayasu Okushima of Japan High School Baseball Federation to discuss mutual exchange and development of high school baseball of Japan and Korea. In response to the request of President Lee, the JHBF President shared his views on the current state and the background of success of high school baseball in Japan. 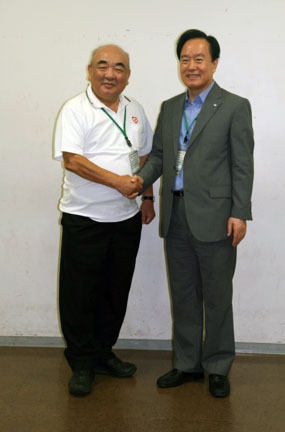 JHBF Secretary General Maso Yamaguchi and BFJ Executive Director Masayuki Naito joined the discussions.